The locksport community is always innovating. The latest trend that people seem to be trying are pin in pin security pins. These pins make picking very difficult. You might be wondering just exactly how it works. What can we learn from these security measures? Are there pitfalls to their use? Is this a trend that lock makers need to take notice of, or is it just a fad? What do you need to know before you try and make them yourself? We are going to talk about it all here. After this article is over you should have a better understanding of just what these contraptions are, and what they mean to you. They may be the future of physical protection or just a break from the reality of security. There is also a chance that these pins are a stepping stone on the way to an even better type of lock. Find out more, and judge for yourself. 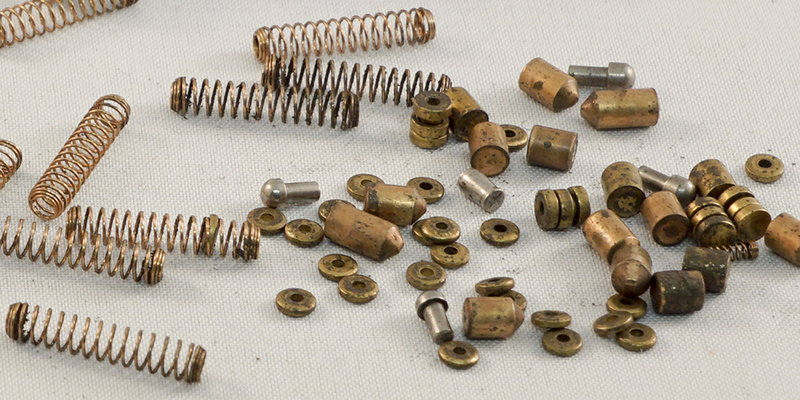 Simply put, Locksport is the community of competitive lock pickers. The community is built on the exchange of locks and picking secrets. With this group of dedicated enthusiasts, security companies are constantly being made aware of the bypasses and weaknesses in their products. On top of that, this group is always innovating the world of safety with new and interesting designs. They use their competitive spirit to create and defeat the best protections that the world has to offer. Most recently, a trend has arisen in the ranks of locksport. People have begun to experiment with a particular type of security pin: The pin in pin. A pin in pin is also sometimes referred to as a floating pin or sleeved pin. All of these names serve as illustrations of what makes them so unique. Essentially, what you have is a pin that has a hole bored through it. The end result is what looks to be a toilet paper roll. As difficult as a hollow pin may be to pick, there is still more security to add. Once the pin is hollowed out, it is time to add a pin to the hole. Much like a washer and a bolt, the two pins fit with one another. The second pin is shaped like a capital “T”. The top of the “T” keeps the second pin from falling clean through the hollow pin. If we were to think of the pin as a sword and sheath, the hollow pin would be the sheath, and the “T” would be the sword. We will then refer to the top of the “T” that keeps the pin from falling through, as the “hilt”. 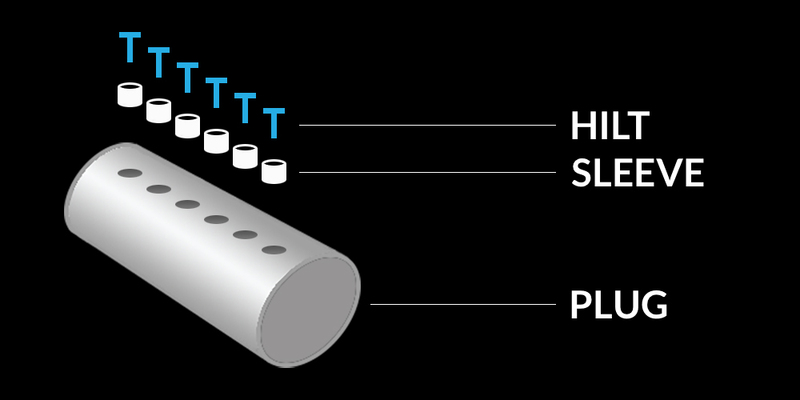 When used for driver pins, the hilt of the of the “T” also serves as a platform that can be pressured by driver springs. Without the hilt, or if the springs were too open, the “T” would get caught in the springs. Because the springs push the “T” down, and proper manipulation requires them to be moved up, it is almost like they are floating. Pin in pin style security can also be used for key pins. This will look very similar to a floating driver pin, except that the “T” will often not go clean through the hollow pin. And a floating key pin will create a very different problem for pickers than a floating driver pin. Effectively, what these security pins do is add an additional pin to pick. If the lock has seven pins, and each is a pin in pin, then you are pretty much picking 14 pins. Think of it this way: You are picking a lock, and you find the binding pin. You pick it and then you move on. At this point you would hope that the hollow pins are not spools, serrated, etc. Because they would be giving false sets on your way to the dealing with the “T” pin. Once the hollow driver is picked you will get a very deep false set, because there is very little metal actually binding the core. Really all that is in your way are a set of thin little knobs. The trouble with pin in pins that are used as key pins comes from oversetting. If you have overset a key pin, it is pretty easy to tell. You will just go down the length of the keyway and find that there is a key pin missing/stuck. When used as a floating pin, you will feel that the key pin is in the plug and moving freely with no spring tension. What will take some time to discover, is that part of the pin has been overset, and that is what is hanging up the rotation of the core. Where driver pin in pins are meant to stay together, the idea of key pin in pins is to break away. However, they can be implemented in the opposite way. For more fun with pin in pins, there is the double sleeve, which combines the breakaway with the clean through style. Essentially, you have a “T” that goes all the way through its sleeve and protrudes from the end, so that the springs can give pickers a hassle. Then there is a secondary sleeve which can break away. This gets the picker at every stage in the picking process. When initially moving the pins you can get hung up by part of the driver pin sleeve breaking away. To fix that you may over set your key pins. Then after all of that is done, the “l” (or blade) of the “T” is still binding the core. Add a break away key pin in pin to that mix, and now you might not even know that you over set a part of the key pin trying to fix the breakaway driver pin. Furthermore, adding serrations and grooves to the pins, as well as counter milling and threading to the chambers, will make the pins bind frequently. The trick to making a pin in pin tough is making them right. With this much free moving metal in a lock, things can go wrong pretty easily. Just think about it like this, “The more moving parts, the more parts there are to cause problems.” There is a spectrum of effectiveness on these locks. It can range from the borderline impossible to pick to a high susceptibility to raking. The biggest mistake is often how the driver pin in pin “T” hilt rests against the spring. They can often be too small, or too loose in the sleeve. If they are too small, they are going to get hung up in the spring and defeat themselves. If they are too small, they are going to get hung up in the spring and defeat themselves. If they are too loose, the pin might be pushed up at an angle and stick into the spring, similar to the aforementioned problem of hilt size. If done wrong, you may also just break the lock. Pin in pin locks need to be made with very precise measurements. There is a good chance that the pins you make will not function properly in the lock. Inserting the key might bind the core, or the key may simply not work. You should use a little trial and error before completely reassembling your lock. When a floating pin style lock is executed perfectly it seems more like a work of art than a form of protection. What perfect execution looks like is a lock that gives you nothing but confusion while you are probing around in it, but still functions with the key. Smoothness in use, and a beast to pick. This type of lock really just fights you every step of the way. Certain designs may be better than others, but a well-executed pin in pin design should give most pickers a run for their money. Standard operational smoothness is often not a concern for locksporters who are making challenge locks, but it is a sign of impeccable craft. It is also a great deception. When a hobbyist gets a lock from another hobbyist, a lock that doesn’t work very well with the key is a strong indication that it is a challenge lock. Smoothness can also be hard to achieve if you are trying to push the limits on what a pin and pin lock can do. All the moving parts and serrations often demand some finesse with the key. In addition to being a good deception to your fellow locksport community, it also shows the practicality of your design. There is nothing better than a complicated design that is not complicated to use. So how practical are these locks? As much as I would like to see these locks everywhere, I am not sure it is in the cards. The main reason that I want these to be widely available and preinstalled in the locks at every hardware store, is so I don’t have to make one myself. That unease at the prospect of designing a pin in pin system is at the root of their unscalability. They really are pieces of art. There is a lot of personal attention that each lock would need, which would keep the idea from getting to the mass market. It is a specialty item. And on the plus side, that means that the security is that much better. The fact that each lock needs a certain amount of personal refining means that you will get protection through variation. You can also add to that protection through obscurity because most people will not have the means to practice with these types of locks. This is not a practice lock that beginning lock pickers will be able to open. But what does that mean for your protection? It means that if you have a great pin in pin style lock, you are very secure against lock pickers. Unfortunately, bad guys do not pick locks. A lock this hard to pick would not be very practical for most people. However, it may be perfect for some people. Be sure to do your own security risk assessment to find out the type of protections that are best for you. Right now, this is the cool thing. If you are making challenge locks, and you are not making any pin in pin designs, then you are pretty out of the loop. It shows the skill of the craftsman and actually creates a challenge for the picker. I am not sure that it will ever really go away, but I think it will leave center stage. My prediction is that these security pins will become like a very prominent old actor. They might no longer be a star, but people will take notice when they make a cameo. And young people will eventually rediscover them and they will be hip again. I do think that the buzz around them is a little extreme. Ultimately it is deserved, but it is just not maintainable. I do think that the buzz around them is a little extreme. Ultimately it is deserved, but it is just not maintainable. I do not see it taking hold in the mass market, but there might be a future for these security pins in higher end locks. Of course this is already the case, but I am talking about the highly complicated designs with threading in cylinders, breakaway pins, double through sleeves, etc. I am talking about further expansion on these ideas by a company. I predict we will see some new designs from the more exclusive brands before the interest dies down. You now know a little more about pin in pin security pins. You know how the look, what they are meant to do, and what happens when they are not made properly. I do not believe that these locks are overly practical. They seem too difficult to make, and their only return on investment is an immense increase on picking resistance, but they are by no means a type of unpickable lock. I do not see these pins leaving the lock industry anytime soon. Whether they catch on or not, I think they have found a pretty permanent place here in the locksport community. There is definitely a chance I am on the hype train a little too much, and I am giving these pins undue credit. Only time will tell. That is the beauty of being in a trend. There is also the balancing act of trying to gauge where you are in the swing of things. Are we at the end currently? Or perhaps this is just the beginning. That will be up to history to decide. Let us know what you think in the comments below.